One of the most important services we offer is office cubicle and office furniture repair. Like anything else, office furniture can be damaged accidentally. It can also deteriorate through normal wear and tear. Procrastinating repairs on damaged work areas and/or components can lead to diminished functionality which can have a negative impact on productivity and security. While all office furniture comes with some kind of manufacturer’s warranty, these warranties are often limited in scope and last for only a short period of time. From a purely fiscal perspective, it is always best to protect your investment with additional maintenance services. Cubiture can arrange a custom 1 year, 3 year, or 5 year maintenance package that extends far beyond the limits of the original warranty. Basic maintenance can be done onsite in your office. 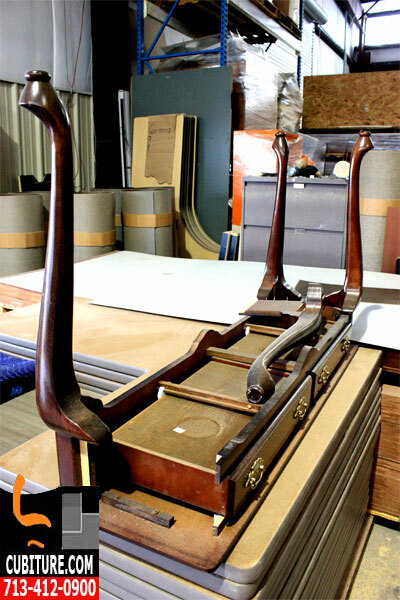 More complex office furniture repairs can be implemented in our factory warehouse in Northwest Houston. Our team will handle the pick up, transportation, and repair for any damaged products covered by your agreement. We will also handle the installation and reconfiguration of revitalized furniture. Clients who opt for these additional services enjoy benefits that few, if any, of our competitors can offer. In addition to basic office furniture repair, we also attend to the aesthetics of your cubicle systems and office furniture. We clean and polish all work surfaces. We test your electrical connections, mechanicals, and all light bulbs. Call Cubiture today if any of your work surfaces are dirty or in disrepair. If you have broken equipment, call us immediately to schedule office furniture repair as soon as possible.